Yup, that is for sure -- they are everywhere! Usually I am not fond of the critters, but these bugs are just too wonderful not to love. 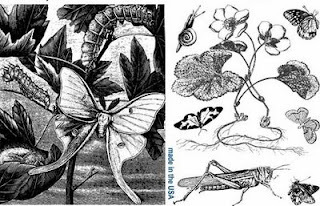 The grasshopper (and rooted floral) are stamps from the Two Nancy's Art Stamps that I am giving away in THIS POST (click HERE to enter). 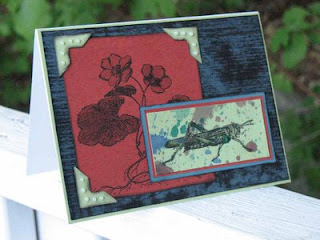 I stamped the grasshopper on a piece of Splatter background. What, dare you ask, is a "Splatter Background?" Well, if you are a subscriber, that mystery will be answered for you next week. It is one of the 15 new techniques in the June 2009 edition of the TJ Newsletter. One of the things I love about stamping the very most is that you can take stamps from ONE stamp set, or even one stamp, and use it in trillions of ways. 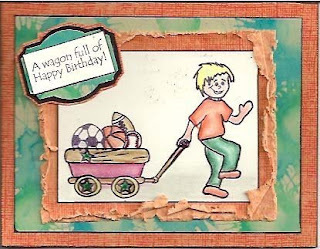 Kathie McGuire used this stamp set as the example for one of the June Tutorials, and I have been trying to find a way to coerce her to mail it to me! I will just have to CASE her and make my own -- and then I will share it with you as a sneak peak. Now, I am off to an evening barbeque. Here's hoping that this grasshopper is the last bug I see tonight -- unless the ones I see are, um, splattered (sorry, couldn't resist!). A knock your socks off Giveaway! Ladies and gentlemen, I have been waiting for this for weeks! This year, one of my favorite stamp companies, Two Nancy's Art Stamps, has had issues with their website. Well, I am here to tell you that these issues are all worked out and you will find the most exquisite stamps -- and fabulous deals -- on their website: http://twonancysartstamps.com/ . The stamp sheet you see above was their first design, so it is fitting that we give it away this week to help kick off the re-opened site. And from today until June 15th they are giving all TJ members a 15% discount on their total purchases! You can use the same discount code as is posted on the ad on my blog's sidebar: TJ2009. To sweeten the pot, if you spend $20.00 or more, you will receive a free surprise gift, too! In addition to the gorgeous stamp set above, I will be sending the winner the card above that uses a technique called "Double Bugging" from the soon-to-be-released June 2009 issue of the Technique Junkie Newsletter. 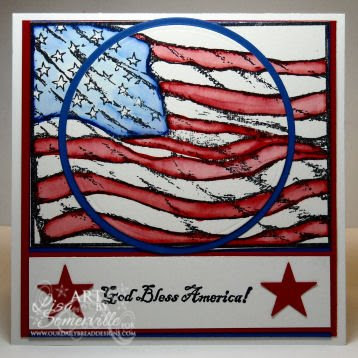 This very easy -- yet stunning -- technique from TJ Designer Ann Clack is full of texture and color -- you will love it! And wait until you see the pictures on the TJ subscriber-only pages for June - several of the DT members have used the stamps above and their designs are to-die-for-fab! To enter the giveaway for the stamps above and the card, enter a comment on this post. I will accept entries until Tuesday, May 26th at 9am. Make sure to leave me your first initial and last name or some variation of your email address so that I may contact you. Good Luck! The winner of this giveaway is Susan Best, congratulations! Stamp the images in Black StazOn. Color using the Colored Pencils and Gamsol Technique (Gamsol Pearls, without the pearls: June 2006 issue of the Technique Junkie Newsletter). Edge this in black marker. Layer over orange frame made using the Torn Frame Technique (December 2008 TJNL). Layer the frame over the green background made using the Bingo Blast technique (April 2009 Technique Junkie Newsletter). Edge with black marker. Create the word/tag using a punch and background from Bingo Blast -- layer over black and orange papers. Mat on orange cardfront, then vanilla card base. Grand Prize. And guess what? Technique Junkies receive 15% by emailing their order to clearartisticstamps@belindalandtroop.com!! To enter the giveaway for the stamps above and the card, enter a comment on this post. 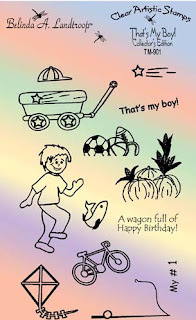 Let me know what little boy in your life would be perfect for this card! I will accept entries until Tuesday, May 19th at 9am. Make sure to leave me your first initial and last name or some variation of your email address so that I may contact you. Good Luck! 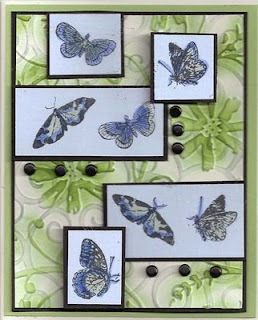 Congratulations to Cindy Luckett, the winner of these stamps and the card! I am so late in posting this week! To make up for it, I have a very special giveaway for you. Today's giveaway sponsor is Our Daily Bread Designs. This gorgeous patriotic-themed set will wing it's way to one winner, but YOU can order it (or any of the other beautiful sets on Kelley's site) for 10% off using the code TJShop on the ODBD site! 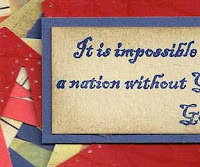 As they say on TV: But wait! There's MORE! Ohhhh, sorry, I guess you can't tell what the technique is much by the scan, can you (snicker, snicker)? To enter this giveaway, why don't you give me a guess about what YOU think this technique is when you leave your comment. You do NOT have to be a TJ subscriber to enter this giveaway. Just leave a comment with your email address or some identifier (like your name) in the comment along with your guess. Entries should be submitted by Wednesday, May 13th at 8:00am EST. Good luck! The winner of this giveaway is Catherine Kraft -- congratulations!